This shot was taken somewhere near Ganpati Plaza, Jaipur. I went there to pick up a Flash Trigger, which was required for a professional photoshoot. I parked my Bike near the Famous "Gulab ji Chai wale" or Gulab ji Tea Stall and went for a walk with my Camera. I thought it would be a nice idea to check around for some Look Up Minimal Shots of the buildings. Near Neelam Hotel, Spotted this Broken Window Pane. I just took one shot for this. It is fun when you get your desired composition in the first try. Also, as you can see, this is Minimalism as Simple Geometry. That Missing / Broken Window Pane Pops the otherwise Mundane Shot. Hope you enjoyed the Broken Window Pane Minimalist Photograph. 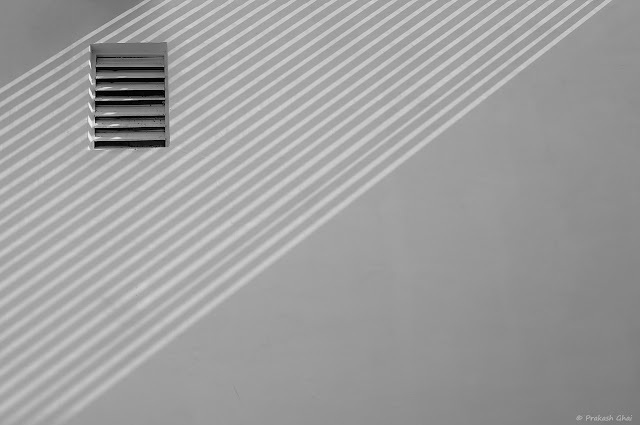 "A Black and White Minimal Art Photograph of a Window with Horizontal Blinds, placed on a White Wall with Diagonal lines created by Light and Shadows." 1) The Lines created by Nature. 2) How there were only a handful Horizontal Lines amongst the many Multiple Diagonal Lines. 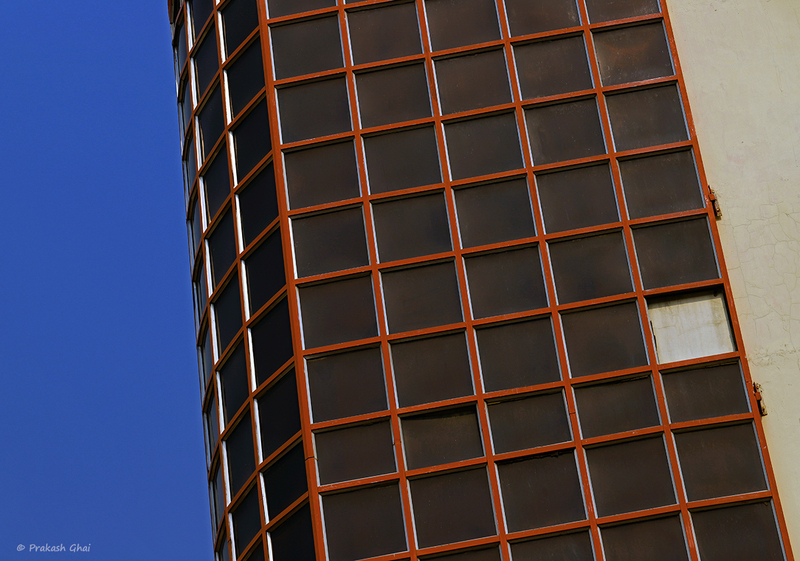 Hope you enjoyed the Diagonal Versus Horizontal Lines Minimalist Photograph. 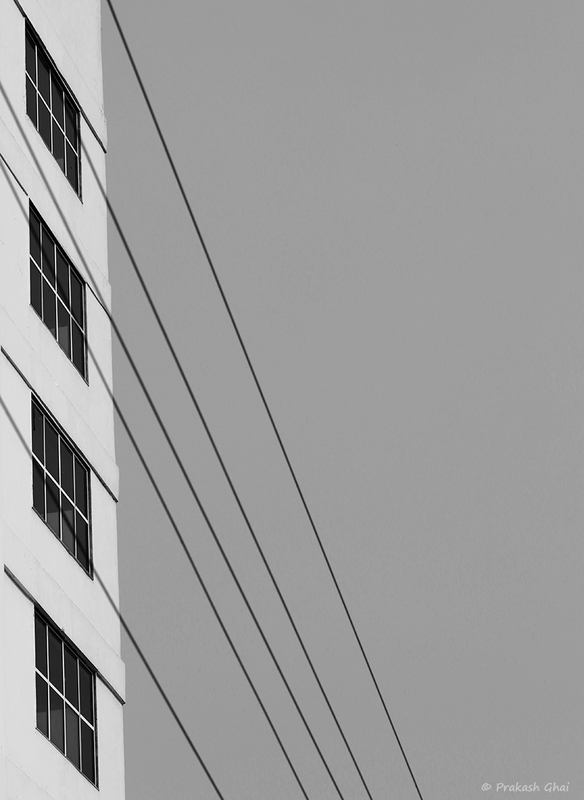 A Black and White Looking Up Minimal Art Photo of Four Windows of a Building and Electricity Wires Overlapping them. This shot was taken near Ganpati Plaza Jaipur, opposite to the Old Gulab Ji Tea Shop. This is Classic Minimalism with lots of Negative Space (empty space) on the right. Alternatively, one could argue that this is Minimalism as Parts of the Whole, but that is not my intention here and I personally would not categorize this as that kind of an Image. I can't explain why but it is kind of obvious that the intention here is more towards showing Less Elements and Negative Space than any other thing. That effort is clearly visible. Hope you enjoyed the Four Windows and Wires Minimalist Photograph.